I remember the day in March 2011 when my doctor delivered her news: stage 3 cancer. The diagnosis piqued me to consider my next steps. I had complete faith that by combining conventional and alternative treatments I could create wellness for myself. That faith was the spark that has lit my path ever since. In addition to walking, exercising, doing breathing techniques and visualizations, and receiving massage and acupuncture, my diet changed. I began juicing, eating about 50% raw, and taking a combination of supplements. My immune system was completely depleted, and that needed to change if I was going to heal. This awareness spurred me to research. All of the research consistently pointed to four potent ingredients: ginger, lemon, honey and turmeric. They all have anti-inflammatory properties, are high in anti-oxidants, and are anti-bacterial, anti-fungal and anti-viral. I added these ingredients to my diet every day, in anyway I could. Of the four, turmeric is the power horse! It is the most researched substance on the planet right now with oodles of evidence pointing to its anti-tumour properties. After using dried turmeric for a while, I came across turmeric root in a market. It was the first time I’d seen it, and I inspected it thoughtfully. Plain brown with a radiant orange inner flesh. As I wrapped my closed hand around the finger-like root, I felt an instant connection! It came home with me, and the experiments began! My desire was to create a way to consume all four ingredients every day―easily and enjoyably! I decided to combine them into a concentrate. Over the next few years, I obsessed over perfecting the concentrate without compromising its simplicity or its vigour. 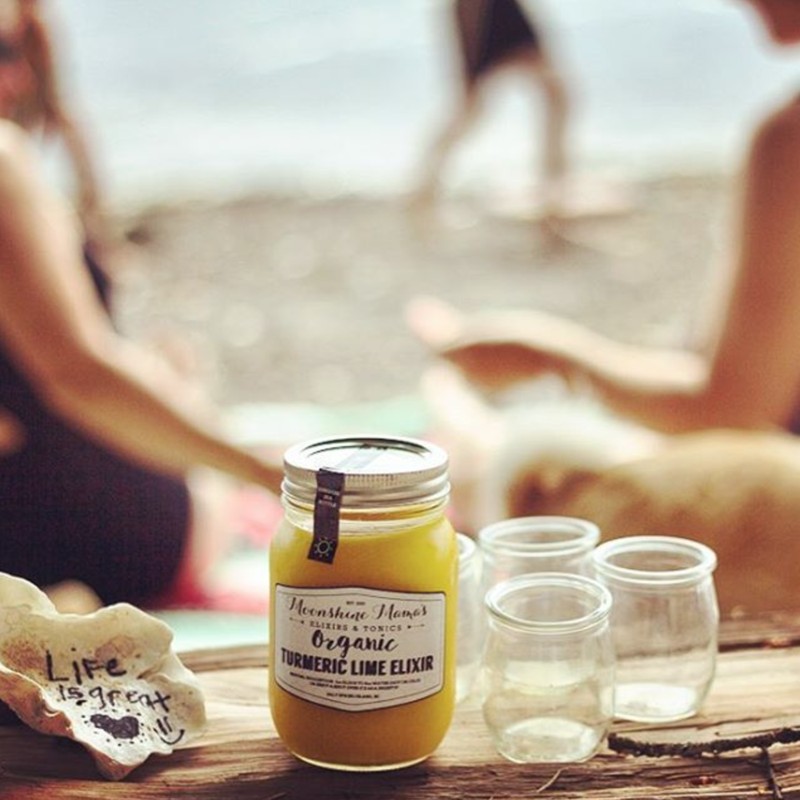 At the heart of our product is turmeric, ginger root, and freshly squeezed lemons. No sugar, just raw honey. My next lesson was learning how to activate the turmeric so that the curcumin―turmeric’s active molecule―was fully absorbable in our bodies. Curcumin is fat soluble, so I also had to learn how to emulsify the coconut oil in the liquid to make the curcumin bioavailable. That was a challenge! As I learned how to extract the most medicinal properties out of the ingredients and combine them in a way that is easiest for your body to absorb, the recipe would tweak and increase in potency! Yet it had the same zesty freshness and a piquant kick with every sip. We now have four flavours to titillate taste buds and a number of new blends in the test kitchen! Turmeric Elixir, Turmeric Lime, and Sour Cherry Elixir are staples. Winter Warrior, our seasonal concoction, is available from September until the local elderberries run out! Since those first few batches, Moonshine Mama’s has become a family business employing my husband, my daughter and five wonderful friends. We are available in multiple stores on the Lower Mainland, Vancouver Island, the Gulf Islands and in Toronto. We still love what we do and we create Moonshine Mama’s one batch at a time, one jar at a time, for health, wellness and enjoyment.